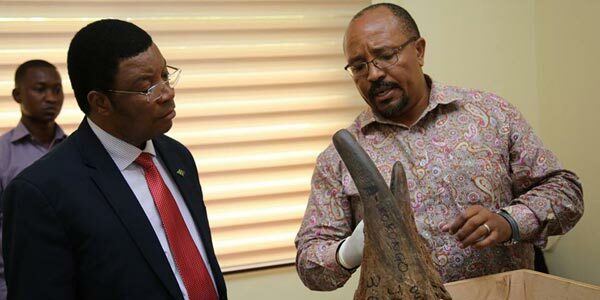 Minister for Natural Resources and Tourism, Prof Jumanne Maghembe, handed to Prime Minister Kassim Majaliwa a report on how rhino John was shifted from Ngorongoro Crater to Sasakwa Black Rhino Sanctuary in Grumeti Reserve. Dar es Salaam. Ministry of Natural Resources and Tourism officials have handed to Prime Minister Kassim Majaliwa a report on how rhino John was shifted from Ngorongoro Crater to Sasakwa Black Rhino Sanctuary in Grumeti Reserve. The premier was also handed a pair of rhino John horns, with the large weighing 3.6kg and the smaller one 2.3kg. The documents and horns were handed by the Minister for Natural Resources and Tourism, Prof Jumanne Maghembe. Majaliwa directed the ministry to submit the report and the horns by December 8. A statement issued by Prime Minister’s office quoted Mr Majaliwa as saying his office received the report on early hours of yesterday. "I received the report at 1am today (Dec. 9). but I have directed that we meet after Independence celebrations to discuss the issue,” he said at yesterday’s meeting.